Spending a day (or a week) at Cocoa Beach can be fun any time of the year, but most people crave those summer beach days when the temperatures are in the mid- to high-90s, the water is warm, and the sun is beating down on your skin. 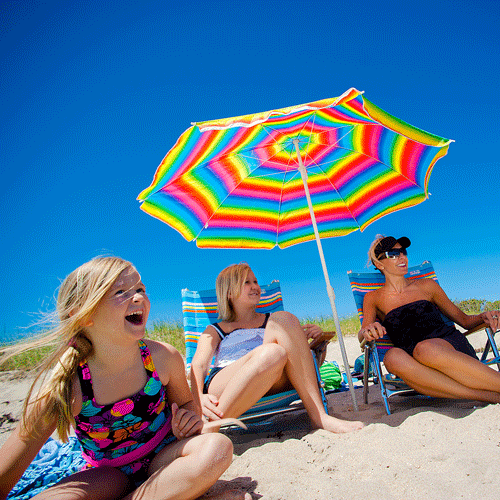 Nothing is more relaxing than spending time with friends or family while enjoying the salty ocean, building sandcastles with your kids, and watching locals and tourists enjoy the beauty that Florida’s Space Coast has to offer. If you are visiting Cocoa Beach, you should know that afternoon thunderstorms can pop up frequently during summer months, so it’s important that you plan your days accordingly. Our local news stations are great at communicating any rain or thunderstorm threats, but we can tell you that the thunderstorms come almost like clockwork. If you are planning a vacation with your family and are intending to spend a lot of time at the beach basking in the sun, here is a fun schedule that we recommend to help you beat those summer storms. Sunrise Beach Walk: Get your morning exercise in while you enjoy the beautiful sunrise that the East Coast has to offer. Breakfast: Look for some local breakfast spots where you can fuel up on water and protein so that your body doesn’t get dehydrated while spending time in the sun. Two of our favorites are Simply Delicious Cafe and Bakery and Barrier Jacks. Beach Time: Getting out on the beach by 10 a.m. is ideal timing. It provides the perfect sun coverage before the high-noon sun, and the beach shouldn’t be too crowded so you can scope out a great spot for the family to relax. Lunch: Our favorite thing to do is to pack a lunch. If you want to eat on the beach like a true Floridian, then get a Publix sub that morning, and pack it in the cooler with you. This will give you more sun time before those storms hit the area. Typical rain and thunderstorms can roll in anytime in the afternoon, usually between 2 - 4 p.m. It’s best to check the local weather station, or a weather app on your phone, but at this time, it’s good to start finding some indoor activities to take cover from, not only the rain, but also the sun. Here are some of our favorite rainy day activities for when those storms roll in. The Historic Cocoa Village Playhouse - A true piece of Florida’s Space Coast history, the Historic Cocoa Village Playhouse opened its doors in 1924, in which they first showcased silent movies. Today, both locals and tourists love the playhouse for the amazing productions and talent that are featured each season. The playhouse is a perfect spot to get indoors, and enjoy the culture that Florida’s Space Coast has to offer. Florida Surf Museum - If you are fascinated with surfing and want to know more about its history, then the Florida Surf Museum must be added to your rainy-day list. The museum, founded by locals, offers a unique history and preservation of Florida’s surfing culture. Exhibits are rotated in the museum frequently, so be sure to check out their lineup online to see what you will get to hang 10 with! Sky Zone - This indoor trampoline park is loads of fun on a rainy day! From climbing the rock wall and jumping in the foam pit to bouncing on trampolines and dunking basketballs, children and adults alike will burn all that pent up energy and forget all about the rain. ClayZ Arts - If sitting down and relaxing to the sound of the rain is more your style, then we suggest a trip to one of our pottery stores. ClayZ is a local favorite and offers pottery painting, glass painting, canvas painting, and even has a wet clay area. Maybe you can paint a nice vacation memorabilia piece that will evoke fond summer memories of your vacation on Florida’s Space Coast. Evening Beach Walk: By the time you finish your afternoon exploration of the Cocoa Beach area, the rain and thunder should have subsided, and then you can get back on the beach for an evening walk. In the summer, the sun doesn’t set until about 8 p.m., so you have plenty of sunlight and relaxation to wind down the day, and think about all of the fun that you can have tomorrow. The most important thing to remember is to not let a little bit of rain bum you out. Florida’s Space Coast has so much to offer other than our beautiful beaches, and we are confident that you will be surprised with all of our local hidden treasures.